The acupuncture needles used are hair-like and differ from any other needle you may have come in contact with. 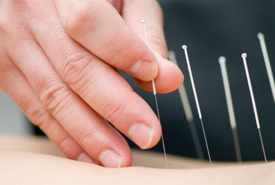 For thousands of years, acupuncture has been used to help people find relief from a variety of common ailments. This highly effective ancient healing solution is another option we offer to our patients from the wide range of services at Dr. Lichter and Associates. Your first acupuncture appointment starts with an initial consultation. Next, Dr. Lichter may perform an examination using Electro Meridian Imaging™, or EMI™. This noninvasive test will determine the energy flows going through your body, demonstrating which areas may benefit from acupuncture. The acupuncture needles used are hair-like and differ from any other needle you may have come in contact with. Even people who feel nervous about needles find that they cannot feel anything once the needle is inserted. If you wish to have acupuncture but do not want needles, we can use electric stimulation or a laser to get the same results. Dr. Lichter earned a license in acupuncture to help people stop smoking after seeing his father die from lung cancer. During his training with Dr. John A. Amaro at the International Academy of Medical Acupuncture, Dr. Lichter realized that acupuncture worked well for a variety of problems. We are happy to offer yet another treatment option to the patients at Dr. Lichter and Associates.